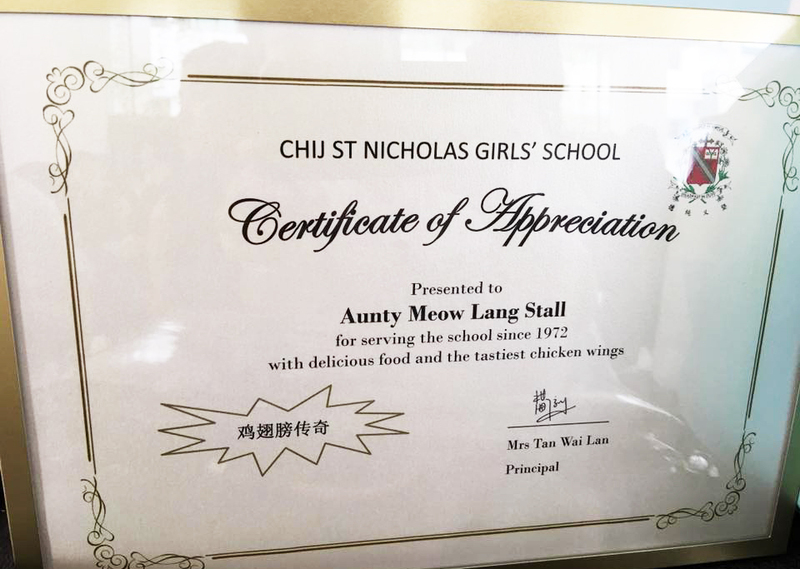 A couple of months back, a western food stall in Republic Polytechnic went viral through this Straits Times article that reported it was selling fried chicken wings famous in St. Nicholas Girls’ School. Having spent 10 years there from Primary 1 to Secondary 4, I instantly recognised the familiar name, “Aunty Meow Lang”. Her stall was one I frequented habitually. It nourished me with homely meals of mushroom rice, braised chicken and eggs, and the occasional bowl of porridge. Fried chicken wings were a once in awhile treat, since $1 for a wing was kind of a luxury on pocket money. Years later, I jumped at the opportunity to meet the owner of the new stall in RP, Aunty Meow Lang’s grandson, James Ngiam—and to relive the taste of those wings again! 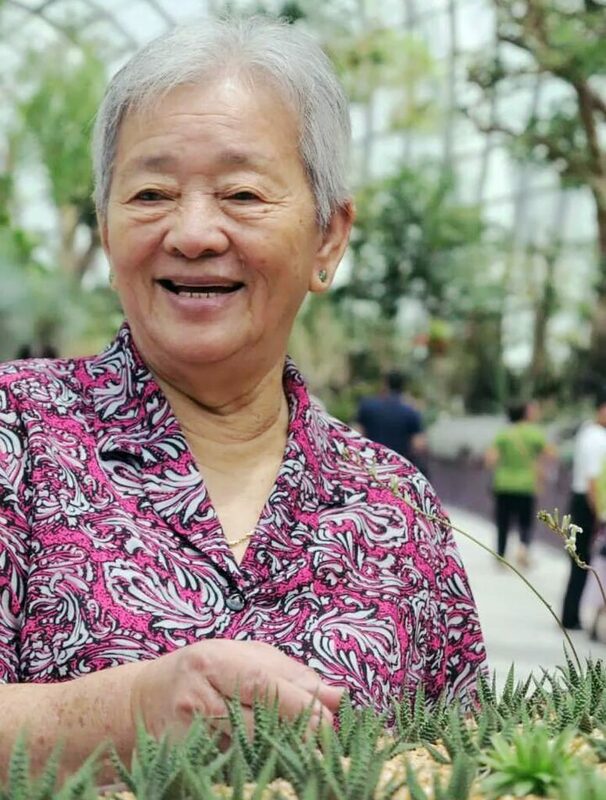 As I arrive at The Lawn foodcourt, James introduces me to two ladies—whose faces I’ve known since I was seven—his mother, Cheah Lee Kuan, and his aunt, Shirley Cheah. He runs through a bit of family history, explaining that his grandma, Mdm Lim Meow Lang, first opened her stall in St. Nicks sometime around her forties. Back then, in 1972, the school was located at Victoria Street (current day CHIJMES), and its Principals still used to be Sisters of the convent. 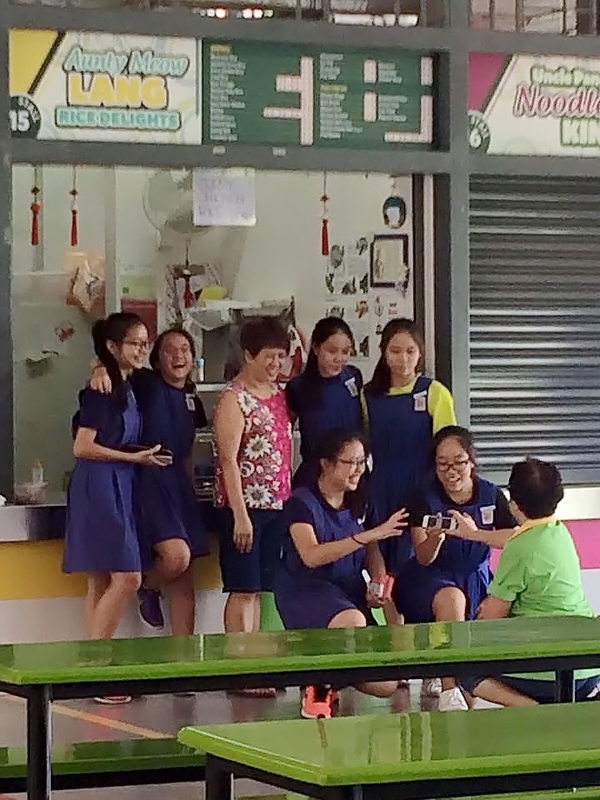 Mdm Lim’s children, including Lee Kuan and Shirley, started helping out at the canteen from as young as 10-years-old. And the story goes: As they kept bumping into each other, they started dating, got married and had children. “So without St. Nicholas, there won’t be me,” James laughs. He spent his childhood tagging along to school when his mum went to work, and as his elder sister began studying there. Being the only little boy in a girls’ school, young James received lots of attention from the “big sisters” and the other stall owners, who treated him to all kinds of food. 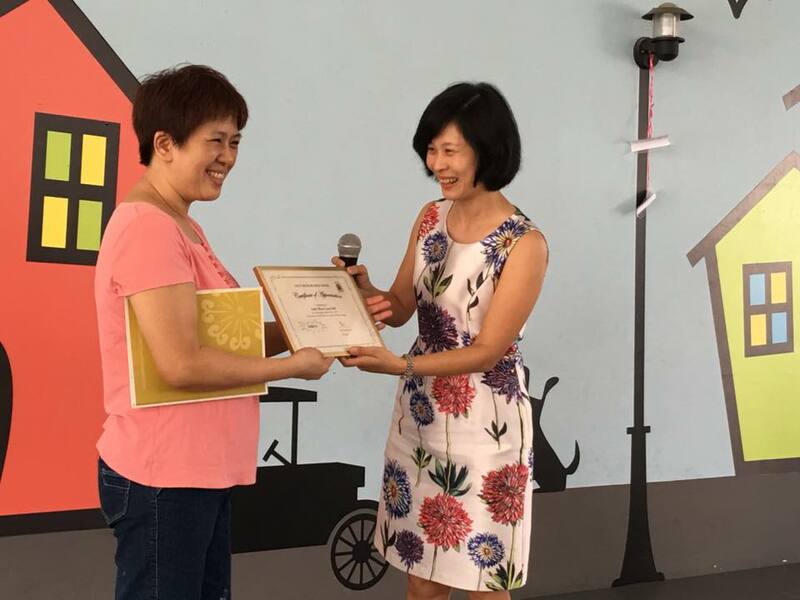 The stall had been through all of St. Nicholas’ relocations, from Victoria Street, to Ang Mo Kio, to a holding site in Toa Payoh as the school underwent major renovations, and finally back to Ang Mo Kio again. 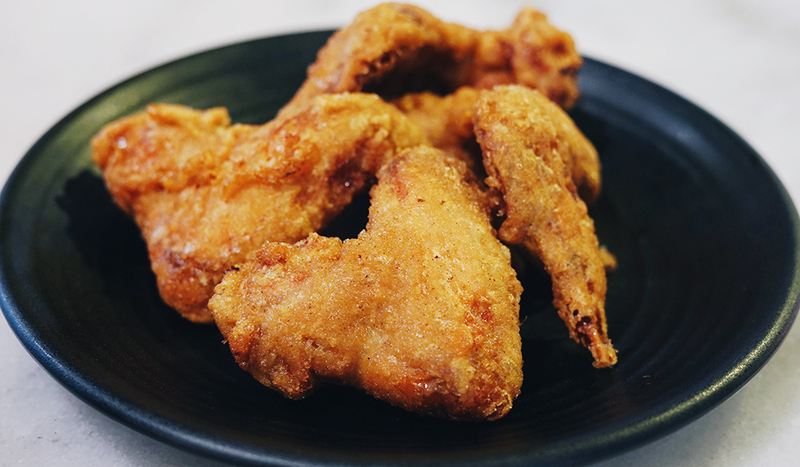 However, as the Health Promotion Board tightened control over canteen food in recent years, the stall was allowed to sell its prized fried chicken wings less and less regularly. From once a week, to once in two weeks, to once a month, and eventually, not at all. “If [the] signature fried chicken wings cannot have crispy skin, or cannot be fried, it would be quite pointless,” James says. The family then closed their stall following Mdm Lim’s passing in 2014, at the age of 82. Today, Lee Kuan continues working with some friends in F&B, while Shirley has decided to enjoy retirement taking care of her own grandchildren. Two generations on, it’s now James’ time to shine, but opening his own establishment hasn’t come easily. Meeting with a motorcycle accident 8 years ago stood in his way of completing his culinary course at SHATEC, as his injuries prevented him from standing for long periods of time, and took him about 3 years to fully recover. At least, he was still able to gain experience through internships under banquet and hotel restaurants, as well as a stint at Barossa at Esplanade. James even turned away from his culinary calling momentarily to try out a career in the marine trade industry. But 3 years into it, he knew his heart still belonged in the kitchen. This time when he came back to cooking, the 31-year-old decided he would start up and be his own boss. 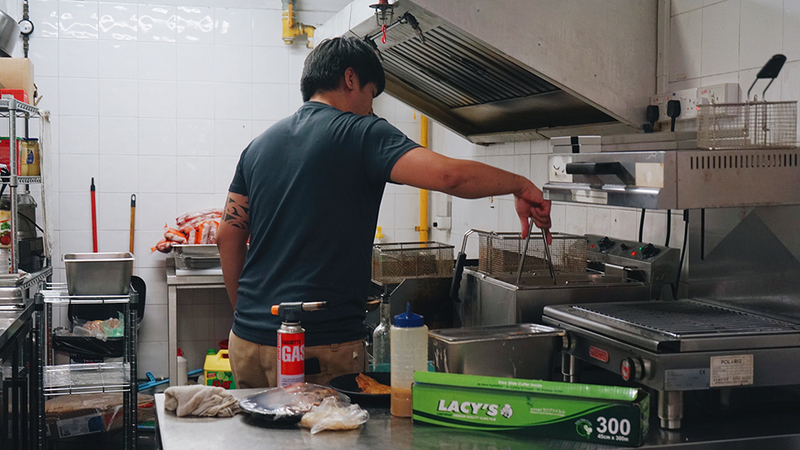 His business partner, Ken Tan, was experienced in supply chain management, and could handle the purchasing of ingredients while James cooked up a storm. They began bidding for a hawker stall since 5 years ago, constantly keeping an eye out for suitable locations offered at NEA’s monthly tender. But without much budget to spare, they tried and failed to obtain a stall more than 10 times, until Ken proposed the idea of starting their business in a school canteen instead—as James’ grandmother had done in her day. 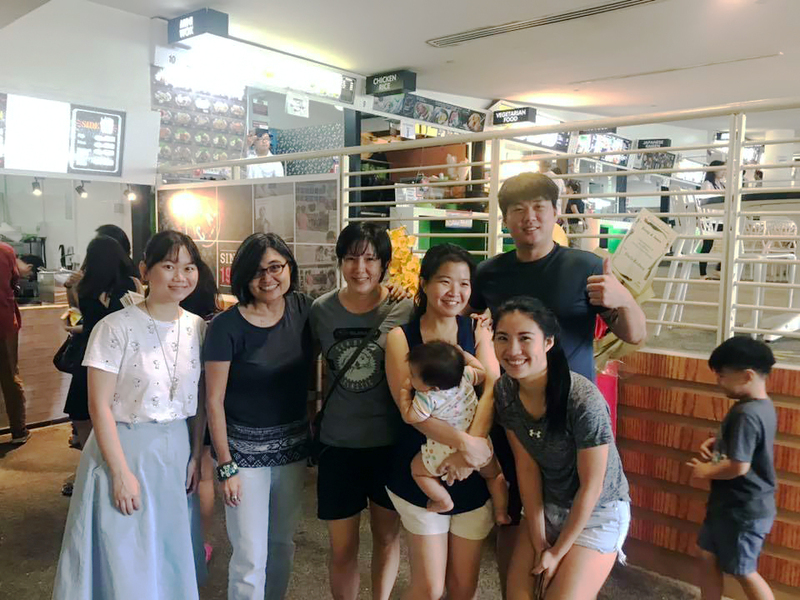 They scored a contract with Republic Poly on their first try, and each pumped in a “comfortable amount” of $20,000 to open their western food stall, Coal 3606. “I received a lot of advice from mentors, saying Republic Poly has quite few students and the crowd isn’t fantastic,” says James. I want to prove them wrong and show that you can start a business anywhere. As long as you have a chance to take, don’t miss it. To push himself, James dove in with a target of serving 150 to 200 customers, and making a revenue of $2,000 per day. But even though customers stream in, consistently exceeding 200 a day, Coal 3606 has yet to hit its sales targets, mainly because they keep their prices incredibly low. Think $5.80 for an Australian sirloin steak, cooked over a lava stone fire—that’s the most expensive dish on his permanent menu. Despite staff and teachers in RP saying he’s “sot” (crazy) for selling steaks and cutlets so cheaply, James believes the prices are right for the student crowd, and hopes to meet his goals through a larger quantity of sales. To provide the best quality, the first-time stall owners don’t mind taking on a bit more work, ordering fresh ingredients daily and marinating them for the next day’s use. My parents always told me: If you want to sell food, you must sell the best for your customers. If you just want to make money and sell lousy food, nobody will appreciate it. To James, it’s crucial to keep his grandmother’s fried chicken wings alive for his generation and the next, as they’ve played a huge part in bringing the whole family together for gatherings since he was little. However, James says there’s “no link” between his grandmother’s canteen stall and his own beyond that. While she sold a variety of home-style dishes ranging from braised to fried items, he has created a western menu based on his culinary background from SHATEC and the restaurants he previously worked at. In fact, the chicken wings are not even found on his menu, as James says he initially couldn’t decide “how to brand” them in alignment with his stall. 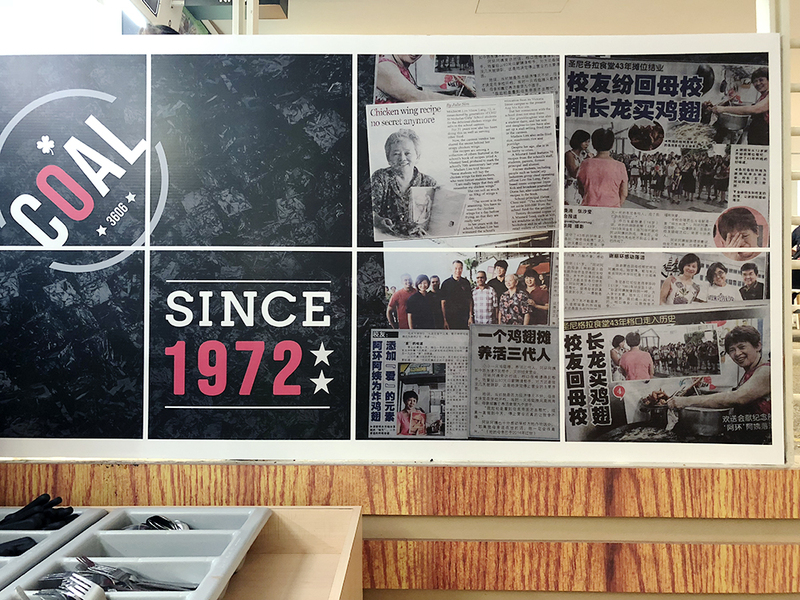 He instead put up a poster to tell the story of his grandmother’s legacy, and lets customers find out about the wings with a little bit of mystery. 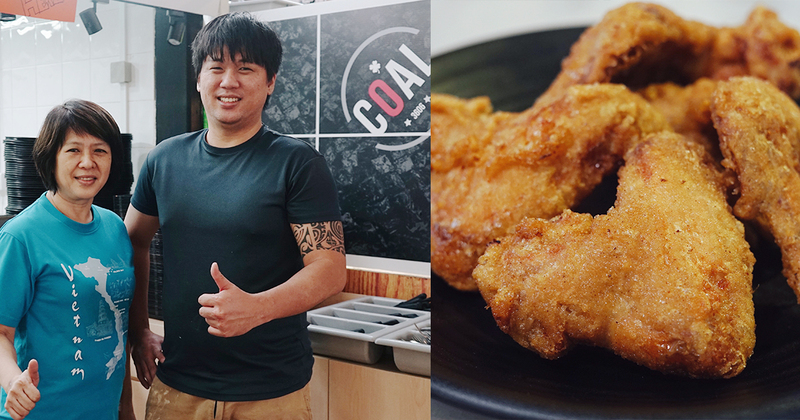 Coal 3606 also celebrated its opening in September with a “pay as you wish” event for St. Nicks students and alumni to sample his recreation of the famous “Aunty Meow Lang” chicken wings. “The alumni say that last time when the chicken wings were being fried, the whole canteen could smell it,” says James. With brisk business in the past 2 months, James even lets customers call in to place orders, so they can skip the queue. 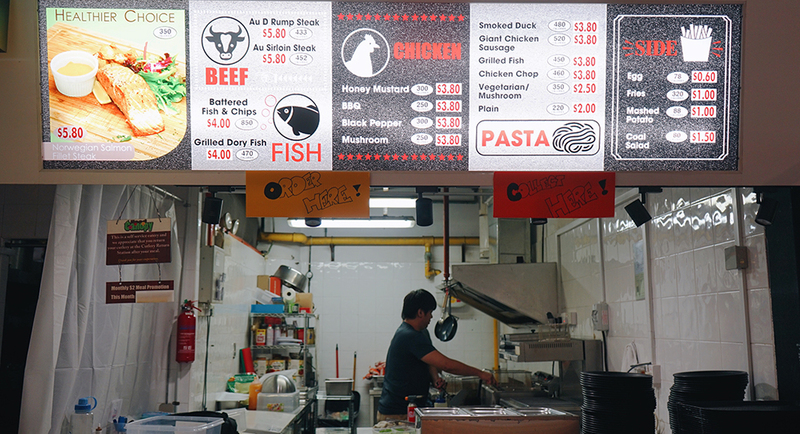 Adapting along the way, he has also begun offering some premium items, such as wagyu steaks and lamb shanks, through which the stall can earn more profit while keeping their regular menu affordable. When these special items are available, James announces them on Coal 3606’s Facebook page and lets customers know how many cuts he’ll be selling that day. While business has only just begun, the new stall owners have already received an offer to open another outlet at Ngee Ann Polytechnic too. However, James says they plan to hold the fort at Republic Poly for the meantime since they’re still so new. If all goes well, they hope to start expanding into other polytechnics and universities starting mid 2019. Click here to find out more about Coal 3606!